Review date: 21 September 2000. For millions of years, human beings have quested for a good, cheap computer monitor. Well, OK, maybe they've only been doing it for 20 years, tops. But I'll never get Leonard Nimoy to do the speaking-book version of my reviews if I stick to the facts. Anyway, quality budget-priced monitors are hard to find. There are, of course, any number of dirt cheap 15 inch monitors out there. But these small screens, with roughly a 14 inch diagonal viewable area, are really too poky for a computer you'll be staring at all day. A 17 inch screen, with roughly 16 inches viewable, gives you about 30% more screen real estate for about 60% more money. This is a premium most people are willing to pay. Around the $AU500 price point, there are lots of unglamorous-brand monitors. All of them have the usual list of grand claims on their spec sheet, and most of them are perfectly all right, but really not terribly exciting. As long as you don't get a lemon, just about any $AU500-odd 17 inch screen is an OK purchase. The tubes aren't terribly flat, the sharpness isn't terribly high, but the price is right. Here, though, is a pretty cheap screen that puts the cat among the pigeons. Samsung's SyncMaster 753DF has an excellent, flat-screen tube, impressive specs, and a very reasonable price. $AU528, delivered. That's only about $AU60 more than the cheapest decent 17 inchers. You get a lot for the extra money. Lots of 17 inch monitors can display ridiculous resolutions. I use the word "ridiculous" advisedly, because just because a monitor has electronics that can tell it to try to paint a 1600 by 1200 image on the screen doesn't mean that it can clearly display those 1,920,000 pixels. 1280 by 960 is a more realistic maximum resolution for even a high-priced 17 inch screen. Interestingly, the 753DF won't even try to display ultra-resolutions. It's good for only 1280 by 1024, maximum. But you're not too likely to use even that mode, because in 1280 by 1024 it only supports a maximum refresh rate of 65 Hertz (Hz - screen redraws per second). 65Hz is noticeably flickery. It's not quite as bad as the 60Hz that modern computers usually default to - in order to ensure compatibility with whatever monitor they're using - but it's not good. Chances are that your video drivers won't let you use 65Hz anyway. For an acceptably flicker free display you need at least 72Hz. 75Hz is a common video-driver-permitted setting. Something like 85Hz is a shade better again. If you drop to 1152 by 864, the 753DF can do 75Hz. At 1024 by 768, it can manage 85Hz. Many cheap 17s are really running out of resolution above 1024 by 768; the 753DF isn't. This is because it has an unusually small dot pitch - the distance between one phosphor dot on the screen and its nearest neighbours of the same colour. 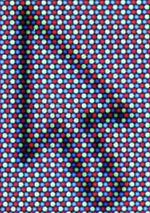 The smaller the dot pitch, the more phosphor dots there are per unit area of screen, and the higher a resolution you can clearly display. Samsung prominently quote the "horizontal dot pitch" in their specs for the 753DF. This is a standard monitor manufacturer's trick. 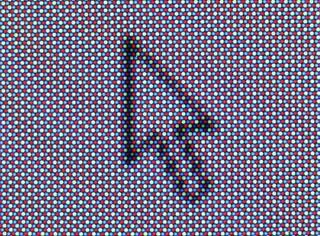 To see why it is a trick, consider this close-up shot of the screen in 1152 by 864 mode, displaying a standard 11 by 19 pixel Windows mouse pointer against a white background. I took the picture with a short exposure, to darken it and make the dots more prominent. 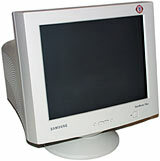 The "DynaFlat" CRT (Cathode Ray Tube) this monitor uses, like most CRTs, has a plain hexagonal pattern of dots. Every set of a red, a green and a blue dot - you need all three to be able to display all colours - is an equilateral triangle. These sets of three dots are called "dot triads". The rows of triads are two dots high. Half of the triads point up, and the other half point down. If you're an amoeba sitting in the middle of a red phosphor dot on this screen, and you squidge your way 0.20mm to the left or right, you'll be on the dividing line between a green dot on your left and a blue dot on your right, with a red dot above you and another below you. Congratulations - you've just moved a distance equal to the horizontal dot pitch. Slime your way 0.1155mm up or down, and you'll be in the middle of another red dot - one of the four nearest-neighbour red dots to the one you started on. This dot has the same position in the dot triad it belongs to as the dot you started on occupies in its. You'll have travelled 0.3155mm in total, because you got to the new dot by moving horizontally and then vertically. But you'll only be 0.231mm, the real dot pitch, away from your starting point. The square on the hypotenuse, and all that. 0.231mm is a pretty impressive dot pitch, especially for a monitor as cheap as this one. That 19 pixel high pointer covers about 42 rows of phosphor dots at this resolution, which means 21 triad-rows per 19 pixels. The 325 by 244mm maximum viewable area of the 753DF translates to 1625 by 976 dot triads. Because a rectangular pixel grid doesn't map cleanly onto a tessellated-triangles dot triad pattern, you need about 1.25 dot triads per pixel, so 1300 by 780 pixels (a non-standard resolution, which the 753DF can't display) is the real ceiling resolution for a clear image. The 1.25 divisor is just a rule of thumb, though, since there's no ISO Standard Fuzziness Scale. Some people seem perfectly happy with cheap monitors running at their highest resolutions, even though the image is really quite blurry. Mind you, these people also have to crank up their system font sizes so they can read the names of icons. If you want a crisp display, it's a good idea to keep on the sharp side of the 1.25 triads per pixel rule. Going by that rule, 1024 by 768 on the 753DF ought to look great. And it does. And 1280 by 1024 shouldn't look too bad, either. And it doesn't, as far as sharpness goes. Shame about the flicker. Never mind, though. 1152 by 864 is an excellent resolution for a 17 inch screen to display, and the 753DF does it in style. The 753DF weighs 16.4 kilograms, which is quite light for a flat 17 inch screen. It's 412mm wide by 415.5mm high by 420mm deep (16.2 by 16.4 by 16.5 inches) in size; pretty ordinary dimensions. It doesn't have a "short neck" CRT to reduce its depth, but full-depth 17 inch screens aren't hard to fit on most desks anyway. It's got an integrated normal 15 pin D-sub video lead. There's no set of BNC connectors on the back for a high quality lead. BNC connectors are commonly seen on larger monitors, but not on 17s. Samsung describe the "DynaFlat" tube in the 753DF as being "infinitely flat", which is a claim I'd like to see backed up by electromicrographs of the, presumably, indivisible subatomic infinite-frequency wavefront of which the tube must be made. Then again, the Samsung marketers also say "The SyncMaster DynaFlat(TM) projects pure, dazzling, distinct colors in a color palette laden with a myriad of combinations. You will find yourself compelled to do things you never thought possible." I'm happy to say that I have not found myself compelled to eat an omnibus, leap a tall building in a single bound or square the circle by my experiences with the 753DF. Which is just as well, since just because you're compelled to do something doesn't necessarily mean you actually can. Subtracting the hyperbole from Samsung's ultimate-flatness claim, though, they're basically right. The 753DF is a flat screen monitor. The front glass has no curve vertically, and no curve horizontally. You can put the edge of a ruler on the surface of the screen in any orientation you like, and there won't be air under it anywhere. Some people get really excited about "the flat thing". Flat screens are in high demand. Fewer reflection problems, less image distortion, right? Certainly, compared with the "bubble" appearance of older screens, modern truly-flat displays really are very impressive. But there are also plenty of only-slightly-curved monitors out there these days, which I think the sensible buyer really should consider. They're really close enough to being flat for all practical purposes. And, importantly, flat ain't necessarily flat. Y'see, the 753DF is probably the flattest looking CRT monitor I've ever seen. But the front of it actually has a curved back face. Which is why it looks so flat. Pay attention, class. I will be asking questions later. Just because the front of a monitor is flat doesn't mean that the actual picture-generating phosphor-coated inside of the front glass is flat, too. The picture you see on your monitor is created by little dots of phosphor glowing when they're hit by a scanning electron beam, and the light passes through the quite thick front glass, and whatever fancy multi-layered coatings the manufacturer's put on the screen, before it gets to your eyes. CRT glass has to be quite thick, because monitors are great big vacuum tubes. They don't need to be built very solidly just to stop atmospheric pressure from crushing them outright, but if you want to make sure they won't implode spectacularly when they're scratched and then dropped, you have to engineer in a big safety margin. Which means lots of glass. The flatter you make the front face of the monitor, the less like an optimal pressure-resisting sphere it'll be. Shapes that don't resist pressure well need even more glass, in order to be strong enough. Curving the inside of the front glass lets monitor makers deliver a flat front, while reducing the amount of glass they have to use. It also makes it easier for the electron-beam apparatus to focus on the screen. Since the three electron beams (one each for red, green and blue phosphor dots) all originate at the back of the tube, it's easiest to keep them focussed if you curve the front glass so the distance from electron gun to screen remains more constant as the beam scans. The flat-front, curved-back design is isn't a bad compromise, by the way, even if the back curvature is enough that the "flat" monitor's image doesn't look any flatter than that of a plain curved-front monitor. Flattening the front glass means the monitor reflects less of the room behind it, which makes it easier to set the screen up where you won't get distracting reflections of lights and windows and so on. Reduced reflections are a big plus for flat screens. Though, again, there's really not a huge amount of difference between a truly flat screen and a slightly curved one. But let's say you've engineered a monitor with no internal curvature at the front. Now you hit another problem. If you make a monitor whose front panel is essentially just a thick piece of plate glass, flat on both sides, the darn image won't look flat. It'll actually look as if the monitor is slightly concave - with the edges closer to you than the middle. This is because of the refractive index of the glass - the amount it bends light, when that light enters or leaves the glass at an angle to the interface between the glass and the air. Refraction's what makes a saucepan full of water look shallower than it is, when you look at it from an angle. In the same way, refraction in the monitor glass makes the phosphor layer look closer to the front of the glass than it really is, when you look at it at an angle - as you do, if you're sitting with your face lined up with the middle of the screen, and then look at the screen edge. Monitor glass is "leaded" - lead oxide's added to the molten glass in place of the calcium oxide used in ordinary soda-lime glass. Basically, this means CRTs are made of a kind of low-grade lead crystal. Lead crystal's used for expensive cut-glass ornaments because it's got a higher refractive index than plain silica glass. 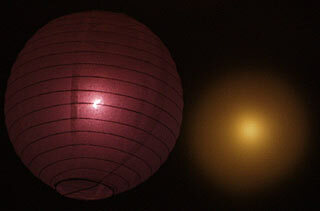 The higher refractive index makes it split light more dramatically into a spectrum than plain glass can. In monitors, the glass is leaded to stop the X-rays produced by the electron beam hitting phosphor and other internal components from making it out to the computer user. The higher refractive index is a side effect, and an unwanted one. It exacerbates the apparently-concave problem, if the phosphor side is actually dead flat. For this reason, the phosphor side of the DynaFlat tube isn't flat. It is, rather, curved just enough that when you're sitting in front of the monitor, the display itself looks near-as-dammit to dead flat. That's not the end of the DynaFlat tube's interesting-ness, though. Reflections in the 753's screen are weird. Check this out. This shows the reflection of the light in the middle of the room, a bit brighter than real life thanks to a slow shutter speed. Reflections from the surface of the screen are as mirror-sharp as you'd expect, but the anti-reflective coating on the glass is unusually effective, and makes the reflection dim, and purple. That's the surface reflection on the left. Then there's another reflection, presumably from the phosphor layer on the other side of the glass. It's a natural-colour reflection, but it's heavily diffused - it's only a sharp reflection if whatever it's reflecting is practically touching the surface of the monitor. The two reflections, together, work out as rather less annoying than the single, simple reflection you get from most of the world's monitors. I didn't have a high-priced pro monitor handy to compare with the 753's reflection-muffling ability, but this Samsung's clearly better than the other lower-priced monitors I've seen, including the rather more expensive 19 inch SyncMaster 900SL (reviewed here) that I use as my everyday screen. Most affordable monitors have relatively simple surface treatments, which just try to cut down glare without eating too many of the photons trying to get out. The DynaFlat tube really is different, and better. On top of the double-reflection effect, if you look at the DynaFlat screen practically edge-on, in the manner of someone gauging its flatness, there's an odd wash-out effect that's reminiscent of the image distortion you get from an LCD panel when you view it well off-axis. You'll never see this effect in normal use of the monitor, but it's quite obvious from an extreme angle. All this isn't to say that this is the oh-my-goodness, gee-whiz, Best Monitor Ever. The 753DF, like every other non-professional monitor I've seen, doesn't hold a constant screen size for all images. The brighter the screen image is overall, the bigger the display gets. So if you load up a mostly-black test pattern and perfectly adjust your monitor so the outer border line hits the edge of the screen as immaculately as you can manage, and then go back to looking at a mostly-white word processor screen, you'll discover that the image has expanded enough that half of the close box in the top right corner of your program window has fallen off the edge of the viewable area. This is an easy problem to work around - just don't try to use that last sliver of black all around the screen. The 753DF doesn't have a serious size-stability problem. There's a trace of blotchiness in the 753DF's screen, too. Slight intensity variations that give a faint "blotting paper" look to the display. It's most obvious when you're scrolling text on a white background, and the text moves but the slight unevennesses in the background don't. I've seen much blotchier monitors than this, though. The 753DF's irregularities are close to invisible. And it's just intensity variation, not hue variation; bits of the screen are a little brighter or darker than they should be, but not the wrong colour, and the screen is very evenly illuminated - the corners aren't any dimmer overall than the middle, that I can see. The 753DF's user interface has its quirks. It uses a minimalist set of four buttons and the usual on-screen menu system to let you set the image size and shape and position settings. There's a complete suite of geometry adjustments, plus moire, and colour temperature, and "zoom" to adjust horizontal and vertical size simultaneously, and all the rest of the fiddly stuff. This all used to be the preserve of deluxe monitors, but you can do all this with every half-decent screen these days. Getting to the more abstruse adjustments requires a bit more button-pressing than I'd like, but that's not a big deal. The adjustment buttons have a very short auto-repeat delay, though; it's tricky to consistently adjust something by just one step. I'm loath to make image quality judgements when I don't actually have all of the contestants in front of me, being fed an identical signal. Even then, different people have different preferences. I'm perfectly willing to say, though, that this is the best-looking low cost 17 inch screen I've ever seen, and it stacks up very well indeed against the big brand competition. Buy from the impressive-badge monitor makers - Sony and NEC - and you'll get picture quality which'll match, and perhaps exceed, the 753DF's. But you'll pay for it. A Sony flat 17 inch screen, their CPD-E200 for instance, costs about $AU775. NEC has cheap 17 inchers that only cost about $AU500, but they've got crummy dot pitch compared with the 753DF, and don't have a flat screen. Buy an NEC FE750, a 17 incher with a flat screen, and you're looking at a comfortable $AU700 again. Probably more, at current exchange rates. The thing can do 1600 by 1200 at 73Hz, but with an aperture grille CRT with a 0.25mm grille pitch - roughly equal to a 0.29mm shadow mask monitor - that resolution's well over the top. Oh, and the Sony and NEC both weigh 20 kilos. Please enjoy your hernia. The SyncMaster 753DF is not just a face in the crowd. It's a really good screen, as long as you don't want super-resolution or the absolute lowest price tag you can find. If given the choice, I'd stick with my 19 incher. That extra room makes a difference, and I don't have any reflection problems, and the SyncMaster 900SL is only gently curved and doesn't create enough image distortion for me to care. But the 900SL's more than $AU840, and the 753DF's less than $AU530. At that price, it's a bloomin' bargain. Recommended. Aus PC Market don't sell this product any more; you can check out their current range of monitors here, and you can also still try a price search at DealTime! Flat screen comparison - Sony, Samsung and IBM LCD monitor shootout! Samsung SyncMaster 900P and 900SL monitors - 19 inch screens; high quality, low price.